You can access this page from the 'Analysis' tab (the top navigation bar). This is an administrative exclusive to Account Admin Users. If you do not see this option and you believe you should have administrative rights to the account, please click contact the Account Admin Users. You uploaded all the files to the case, culled data and also identified duplicates. However, the case still need further analysis before you create Review Sets, and document production. Case Assessment tool simplifies the investigation of relevant documents by creating reports that will automatically extract, organize, and summarize the specific data selected to the documents uploaded to the current case. 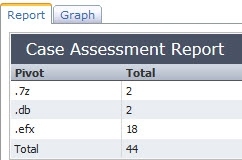 You will look across reports only showing items that meet the criteria you specify. For example, you can generate a report that shows all the responsive files that are assigned to Case Participants and reviewed during the current year. 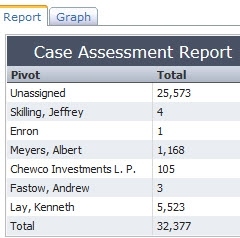 After creating the report, you can export the Pivot Grid version to and Excel spreadsheet and send to your clients, experts or witnesses. 1-Determine the source files to analyze based on the fields (e.g. Master Date, Custodian, Doc Source, Extension, Doc Count, Doc Type). 2-Generate the analysis report to the files to be analyzed. 3-Set parameters for the assessment. 4-Allow us to automatically scan and assess the data uploaded to a case. It allows you to organize and present your data in two reader-friendly, visually appealing formats. You can generate Built-in and/or Custom reports to analyze the data, make comparisons, detect patterns and records such as, the most common file name extension in the case, which documents have case participants assigned to, largest or smallest files, etc. 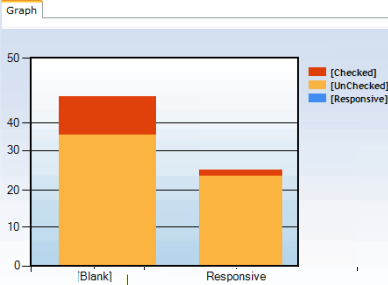 This section displays the standard report result set based on three different parameters (below). Please note that under the Custom Reports fields by default will appear Group By 'Responsive' and Then By 'Attorney-Client Privilege'. Section Option>'Year Only' , 'Doc Count'. >Upload: Doc Count by Master Date: results cull down the the documents uploaded based on the Master Date (metadata field 'Date Sent' extracted from emails). >Upload: Doc Count by Custodian: results cull down the documents uploaded based on the custodians. >Upload: Page Count by Custodian: results display the total number of pages in the document where the email resided custodians. >Upload: Gigabytes by Custodian: results display the number of gigabytes per custodian. >Upload: Doc Count by Doc Source: results cull down the documents uploaded based on the Doc Source, which is a field used to identify entire set of documents at the same time and also allow filtering. >Upload: Page Count by Doc Source: results cull down the total number of pages in the document based on the Doc Source. >Upload: Gigabytes by Doc Source: results display the number of gigabytes per Doc Source. >Upload: Doc Count by File Extension: results cull down the report by the current file format. (.PDF, .DOC, .PPT) and under the Custom Reports fields it is by default 'Group by Ext'. >Upload: Gigabytes by Extension: results culls down the number of gigabytes based on the file extension. 2-Processing Reports: Those reports can be accessed after our processing is complete, assumed expansion for PDF and search index creation. >Processing: Doc Count Unsupported by Extension: results culls down the number of documents that were not converted by Extension, during the conversion process. >Processing: Gigabytes Unsupported by Extension: results display the size in gigabytes by Extension for unsupported documents not converted in the case. >Processing: Doc Count Failed To Convert by Extension: results culls down the number of documents that failed to convert by Extension. >Processing: Gigabytes Failed To Convert By Extension: results display the number of gigabytes by Extension that failed to convert. Please note that Failure to convert a file does not mean it does not contain probative evidence, only that we did not covert it with our automated procedures. These files should be reviewed and further steps to make reviewable should be considered, when appropriate. 3-Review Reports: They are generated for you based on the documents reviewed in the case, using the coding fields Responsive, Non-Responsive, Needs Further Review, Attorney-Client Privilege or Attorney Work Product. >Review: Status Docs: the report displays results by status based on the number of documents in the case check-marked as HasBeenReviewed or Document Reviewed By Me. It is set as the default: Selected: Group By='Review Status' Options='Year Only','Docs'. 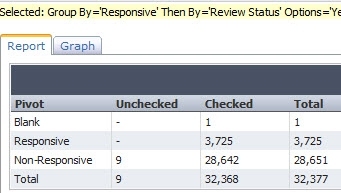 >Review: Status Pages: the report displays results by status based on the number of pages check-marked as HasBeenReviewed or Document Reviewed By Me. >Review: Doc Count - Responsive and Privilege Docs: Responsive and Privileged Docs: you can review which files in the case are tagged as 'Responsive' or 'Privilege'. >Review: Doc Count by Doc Type: results cull down the report by number of documents reviewed including the current file format. (.PDF, .DOC, .PPT). 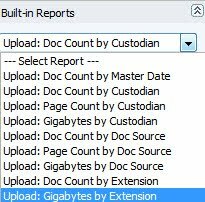 >Review: Gigabytes by Doc Type: the report displays data results by status in the case (HasBeenReviewed= 'Unchecked' or 'Checked'). It is set as the default: Selected: Group By='Review Status' Options='Year Only','GB'. > Custom Doc Fields: Any tags you created yourself and applied to the files. Retrieve results based on specific data (Built-in Doc Fields and Custom Doc Fields), especially in cases with high volume of documents. The results of the report you've created can be easily exported to an Excel spreadsheet using the 'Export to Excel' button. NOTE: only the data the Pivot Grid view is exported to Excel. The results of a search can be also reviewed by using the Case Assessment page and the report displays data in 'Group By' and 'Then By' based in the document list windows under the 'Built-In', 'Custom Reports', 'Options' and 'Filter' sections. Please note that the Query will return exactly 100 rows in the main table. Create custom categories, combine statistics, view independently and easily filter table and view data. MORE.